The software provider Betsoft Gaming has a modest list of slot games, in which the Arrival slots are located. This betting machine has an interesting and peculiar setting because the game contains some science fiction and is full of graphics with astronaut themes, outer space, spacecraft, celestial bodies, asteroids. It is not the first time that Betsoft Gaming has been successful in creating its slots, which can be enjoyed by all kinds of people. If as a player you are looking to make real money or just want to have a fun-filled time on the internet, the Arrival slots will be perfect. This slot located in outer space has among its features, the common five rotating drums and thirty pay lines. The screen of the game consists of the common screens used to make possible the communication with the spacecraft from the ground or from another ship, with the controls at the bottom where the buttons of configuration of lines of payment, bets bylines will be visible, the total bets, the spin button and the max bet spin button. 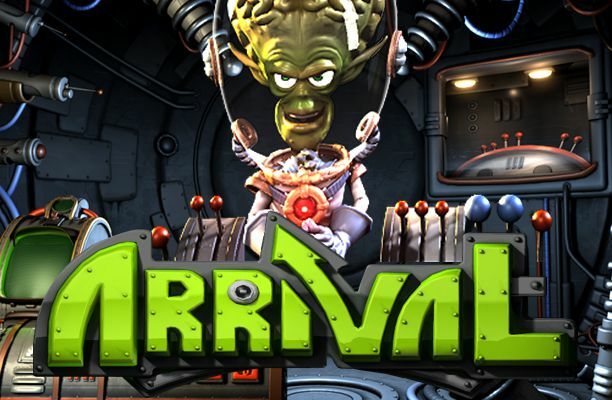 Do not lose sight of a small brain sitting in front of the controls and the communication screen, because this alien is an evil Martian who seeks to seize the planet earth, therefore, as the game progresses, the user will see that this evil extraterrestrial is the one who will return the mission more and more hard. A player can also generate 15 additional spins for free when he gets at least 3 Scatter symbols on the slot reels. When you activate this specification, all of your rewards will be multiplied by three times. This specification will allow you to get extra 15 spins for free by getting at least 3 Scatter symbols. If you get the symbol of Agent Jane inside a winning combination your rewards will be doubled. The game has a Wild symbol that can replace all of the symbols in this game. However, there is one symbol that no other symbol can replace. Among its graphics is the protagonist of the game, who seeks to rescue the girl who has taken the evil alien as a hostage, in addition to him, the player will get graphics of planets with rings, spaceships, evil extraterrestrials, a class of insignia of the Corps of Marines, another friendly alien, a bus and the girl who is part of the sailors. Its sound effects go very well with the spatial theme and the musical band has a certain similarity to those used in other movies with extraterrestrial themes as well. A little incessant if you spend a lot of time playing. If the player in the middle of the play takes a long time to make the next turn for any apparent reason, the green extraterrestrial on the screen controls may be annoying a bit, expressing his impatience through complaints that can be heard easily. This online slot has many options when playing, this due to the large number of players that exist with different tastes and purposes. The player can play it completely for free or with real money without having to go to a land-based casino; enjoying the game and your winnings in the comfort of your home. Arrival has a good range when betting, ranging from 0.02 credits to 0.50 credits for each active line, where the maximum number is 5. The player can bet up to 75 credits, and win the incredible amount of ten thousand credits or five thousand in cash, the one you want to obtain. Despite being quite easy and its prizes a bit out of this world, there is no available auto spin button on the board. Certainly, Arrival is a game that if users stop for a moment to analyze it, it will not waste their time. It is a complete package and in general aspects, it is very modest. Its animations, its graphics, the accessible credits with the free credits that can be obtained as it is being played, is without a doubt a phenomenal slot, worthy of an opportunity … or two. The functions of the Arrival graphics have two scatters which is not very common. The player will know that when he gets laser gun graphics a special function will be activated. A total of three or more laser guns will be unlocked and each graphic that fell on any of the reels on the screen will become graphics that the player must select, that is, click on them and thus get free credits automatically. The other scatter plot in the game is the green extraterrestrial, this unlocks a wild function. The player will get these graphs on drums number one, number three and number five, once they take the position after the turn, a spaceship will appear and the first reel, as well as the center and the last one, will automatically expand on a wildcard not expected. Said wildcard graphic has sticky properties and will remain motionless until the next turns come to an end. This sticky property that has some wild graphics in not all slot games represent a very big chance to win many prizes, because they are not graphics that will disappear after the turn, but they will remain permanently or only for a while but the chances of the player Get a prize are incredibly high. In the case of Arrival, the sticky wild card will remain until the end of the game, which translates to possible future fortunes for the player to enjoy. The young lady who is part of the Marines team in space is the bond graph in Arrival. The player must concentrate on taking his own spacecraft to the evil alien and rescue it, This is where the game has very good animations, during the bonus round funny animations are presented where you can see the young lady as a hostage of the evil alien and the protagonist, his teammate of the Marines, tries to rescue her at all costs. Following this round of bonuses, you can get many prizes and different winnings. However, do not be distressed; for this round is nothing less than sensational and fabulous but unlocking it or getting it is certainly not easy. The arrival slot of the Betsoft Gaming team in general aspects is great and unforgettable, this thanks to the perfect work done in terms of set designs and even a small video intro. Everyone loves extraterrestrials and the idea of possible life on another planet; therefore the theme on which Betsoft was inspired gave the right point, forgetting the detail that the graphics seem to be designed with the intention of looking like a caricature with a retro look, a bit old-fashioned, but it keeps the charm and essence. It has for the player’s different options of prices to bet, it only remains to select the one that fits perfectly with its possibilities. The rating score of this game gets an easy eighty-four percent in terms of quality. It has two amazing scatter graphics, very generous wildcard graphic, different types of bonuses; these are characteristics that compensate for the fact that you do not have free spins options nor is it a game with a progressive characteristic, nor the option to obtain multipliers of any kind. Yes, it is a total penalty. Everyone seems to love the multipliers and be quite used to free spins. However, instead of this, in addition to what was previously highlighted, free credits are offered, which is equal to save money. So the Arrival slot machine does not have free spins like most slots, it’s really not that bad. There are many online casinos with different offers of welcome bonuses, or for those amateur players or, you could say, they do not have only two days in the world of slots, they will have their favorite virtual casino marked. Arrival will be easily found in any casino. This slot located in outer space has among its features, the common five rotating drums and thirty pay lines. The screen of the game consists of the common screens used to make possible the communication with the spacecraft from the ground or from another ship, with the controls at the bottom where the buttons of configuration of lines of payment, bets bylines will be visible, the total bets, the spin button and the max bet spin button. Do not lose sight of a small brain sitting in front of the controls and the communication screen, because this alien is an evil Martian who seeks to seize the planet earth, therefore, as the game progresses, the user will see that this evil extraterrestrial is the one who will return the mission more and more hard. Certainly, Arrival is a game that if users stop for a moment to analyze it, it will not waste their time. It is a complete package and in general aspects, it is very modest. Its animations, its graphics, the accessible credits with the free credits that can be obtained as it is being played, is without a doubt a phenomenal slot, worthy of an opportunity … or two. The functions of the Arrival graphics have two scatters which is not very common. How they Love Sticky Graphics!